Recently not only have Ash and I taken up Longboarding, but we’ve been trying lots of other fun things such as slack lining (walking on a special rope that has been stretched out, usually between two trees) and Poi (balls on string that are swung around in different patterns and rhythms). I really enjoy Poi and just have a feeling that this will be something I could actually get really good at if I keep going! (much like my sewing which has been sadly neglected recently, there will be more updates on that soon though I promise!) Ash and Jack taught me my first move, but that was all they knew, some of the longboarding crew also know Poi and a very nice girl taught me some very pretty moves which I am practicing to get them flowing nicely together. Yesterday Ash, Jack and I decided to relax in the park and practice some of our hobbies. Ash tried the Coleman Slide again on his longboard, he’s almost got it and I think it wont be long until he’s busting them out like a pro! Jack wiggled around on his waveboard. I really want to learn how to ride it but last time I tried I hurt myself quite badly, one day I will get the hang of it though as it does look pretty cool! I practiced Poi, trying to link my new moves together. I didn’t quite get the hang of it, at least not smoothly, but i’m getting there. 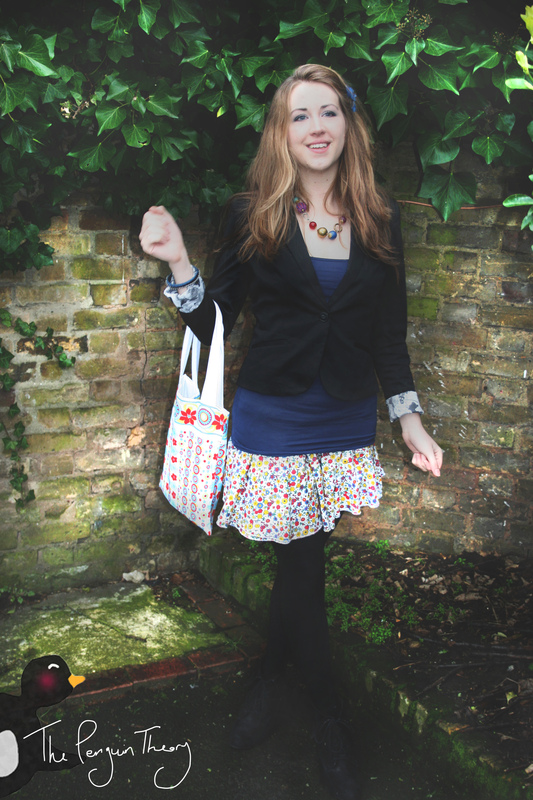 I wore a nice summery outfit with a comfy maxi skirt, flip flops and a flowery top. Well I say top, it’s actually a little skirt but as I was looking through my wardrobe I started thinking a strapless, flowery top would look nice with my skirt and decided to see what this skirt would look like worn this way. I think it actually turned out really pretty and I’m so excited to now have a ‘new’ item to my wardrobe without spending any money! The boys were also dressed very nicely. Ash was very colour co-ordinated in his green and orange shorts and a green ‘sack boy’ t-shirt, even his helmet (green) and board (orange) matched! Jack wore his usual comfy attire with his nice new shorts from a shop called ‘The New Yorker’ that he found on his recent travels around europe. The shorts were brown with a tribal pattern. I love tribal patterns! 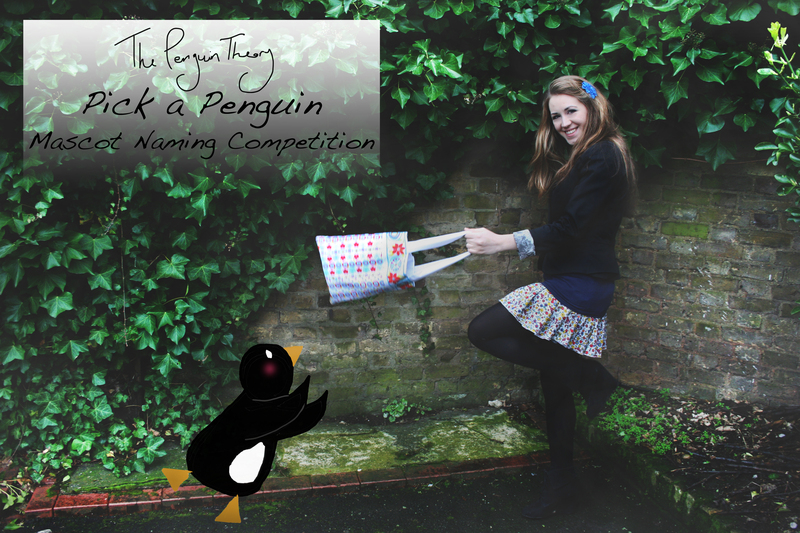 Pick A Penguin – Competition! After months of promising a competition finally I have gotten round to it. 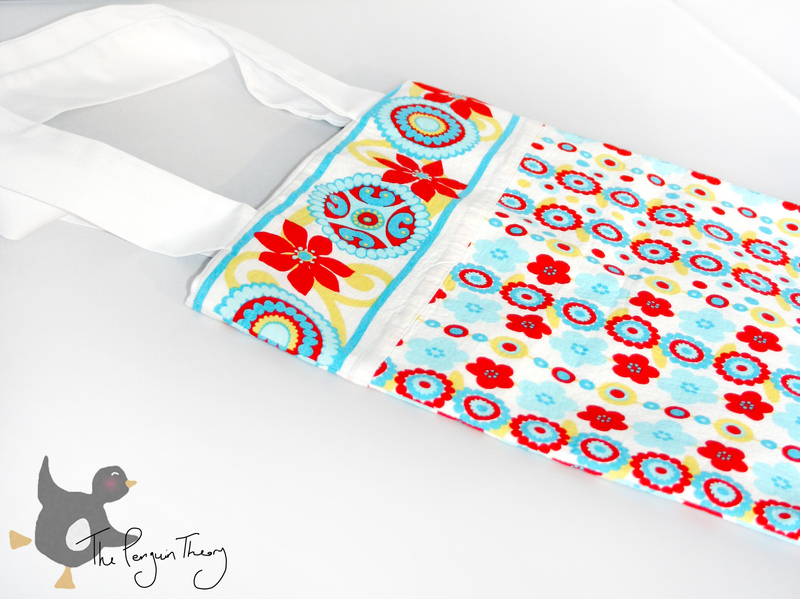 Up for grabs is this cute, summery tote bag, a great addition to any summer wardrobe! Perfect for adults and children alike. 🙂 Even The Penguin Theory’s Penguin wants it! Myself and The Penguin Theory Mascot realised that he doesn’t have a name, this upset us both greatly. We racked our brains for a suitable name but just couldn’t decide on one so we want YOU to help! So how can you help? It’s SIMPLE! Just comment on this blog and/or this image on facebook with the name you think would be perfect for him and that’s it, done! Each person can enter twice (once on facebook and once on here) and I will put all the names into a hat (or most likely a bag) to be drawn in a weeks time.